Recently we (my co-host Steve Garner and I) had one of the last local producers of fresh eggs in Sonoma County on our radio show (www.ksro.com which is archived and streamed on the net). Among the call-ins was someone asking again about the potential dangers of using raw eggs to make sauces like mayonnaise. The fear is primarily salmonella. Our producer noted that commercial egg production facilities are very careful about cleanliness and strictly monitor their eggs so the chances of getting sick from raw eggs is pretty remote. But what about eggs that we buy at the Farmer’s Market? 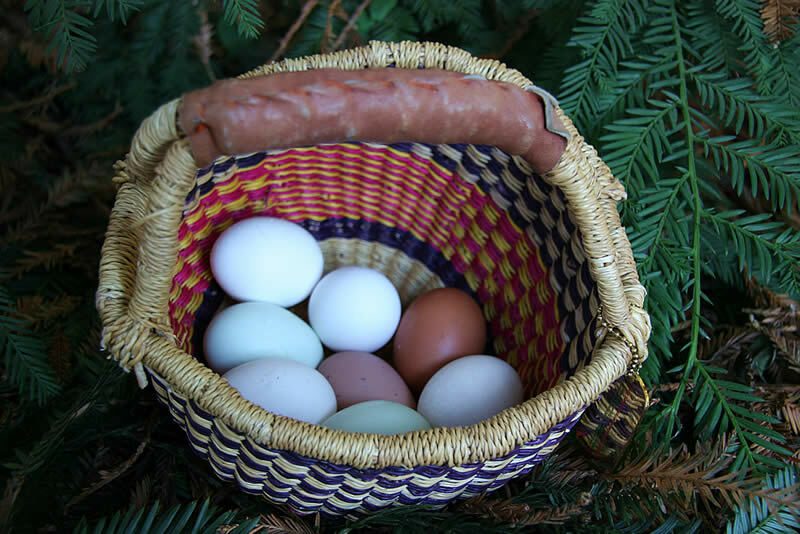 In some markets there are eggs that have been pasteurized in the shell which takes care of this potential problem. If you can’t find them there is another approach which will also take care of the problem and that is to soft boil the eggs before turning them into mayonnaise and mayonnaise based concoctions. Here is a recipe for making the basic mayonnaise and then turning it into my favorite Tartare Sauce. Its delicious served with fried fish of course and also as a spread for sandwiches of all kinds. You might also think about serving it with fried goodies such as the following baby artichokes and onions in a chickpea crust! This is a great approach for those who may not want to use raw eggs. Your own tartare sauce is so much better than the commercial version! Place eggs in a small sauce pan and add tap water to cover by 1 inch. Over high heat, bring to a boil. Remove from heat and let eggs sit for 4 minutes. Drain and immediately run under cold water to cool the eggs off. Peel the eggs by cracking and peeling from the big end first. Break eggs apart into the jar of a blender. Add the mustard and vinegar and pulse a couple of times. With the motor running gradually add the oil until a smooth sauce is formed. Place mixture in a bowl and stir in remaining ingredients. Store covered and refrigerated for up to 3 days. In a bowl stir the dry ingredients together and then whisk in water. The batter will be very thick. Set aside for at least 30 minutes if possible. Peel off the outer leaves leaving only the pale green to yellow leaves. Trim off the tops to remove all spines. With a paring knife peel the stem down from the bottom and around the diameter of the heart to remove any tough outer fiber and then trim off the very end of the stem. As each artichoke is trimmed drop it into a bowl of acidulated water. To cook, in a deep saucepan heat the 5 cups of water, rice vinegar and salt and bring to a boil. Drain the artichokes and add to the boiling liquid. Put a small plate on top of the artichokes to hold them under water and simmer for 10 – 15 minutes until tender and easily pierced with a skewer. Let cool in the cooking liquid then drain and halve or quarter. Remove any small spiny purple leaves in the center and pat dry. Heat 2 inches or so of oil in a heavy pot to 350 degrees. Add the artichokes and onion to the batter. Using a large spoon, scoop some of the batter, making sure you get artichokes and onions in each scoop. Fry for about 3 minutes or until crisp and golden brown. Drain on paper towels and serve warm with the tartare sauce to dip the vegetables in.